If going to the dentist causes you anxiety, you have a sensitive gag reflex or you simply have a fear of the dentist, you should contact us. Our entire Scottsdale office is setup and designed to make your dental visit a calm and relaxing experience. Are you scared of the dentist? Don’t worry you are not alone. Did you know that as many as 75% of US adults experience some level of anxiety or dental fear? It is estimated that 9% – 15% of Americans avoid dental appointments because of dental fear. Dental fear can present itself as either an anxiety or a phobia. In general an anxiety is the milder form of dental fear. Anxiety would be a general uneasiness. A phobia is stronger. A dental fear phobia would be an intense fear or dread of a dental visit. Fear of the dentist is often caused by negative childhood dental experiences, possibly a severe gag reflex, fear of needles, or even the high-pitched sound of the dental drill. The dentist is avoided for years, at all costs, so you walk around with a badly broken down tooth, chewing on only one side of your mouth, until another tooth breaks on the other side. 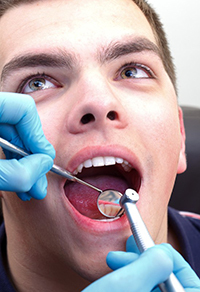 Communication: Talk with your dentist about your dental procedure so you understand what needs to be done. Let them know you are uneasy and give them a chance to put you at ease. Communication is much more than just talking, this includes rapport, body language and even a willingness to listen and understand. Dental Sedation: Sedation is the option when a patient needs something more. A mild sedative form of nitrous oxide (laughing gas) works for some. For others it may be stronger forms of sedation, with a combination of oral conscious sedation and IV sedation. Make sure that the dentist you will be entrusting has the proper Dental State Board Certification and is in good standing. Dr. Kidess is a board certified sedation dentist serving the greater Scottsdale AZ area. Don’t let your fear of the dentist prevent you from keeping your smile healthy and bright. Contact Dr. Kidess and her team today at (410) 991-2290 to schedule an appointment, or to just learn more about dental sedation.